Dana is a minimal, creative Multipurpose Joomla Theme. 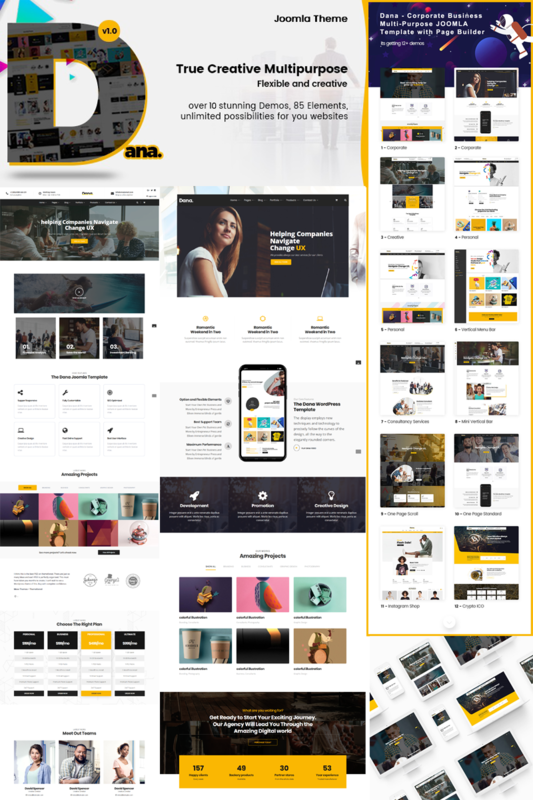 Comes with 10+ Home pages, Dana fits for a range of business & corporation like portfolio, ICO landing page, cryptocurrency, fashion store, one page, photographer, media agency, web studios, designers, freelancers, entrepreneurs, marketing, artistic agencies, corporate, creative business, etc. Dana is fully featured Multi-Concept, responsive, Bootstrap 4 based with Helix Ultimate. The overall minimalist coming near is the one of Dana key point besides consumer-friendly experience and super layout. You will get in addition, Sp Page Builder Pro as page builder and multiple elements to play with. Discover today !